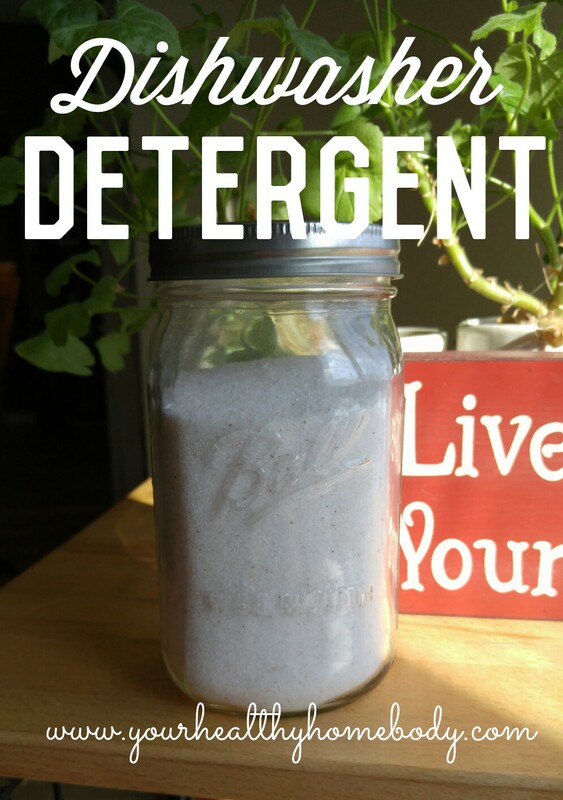 Continuing along with the theme of cleaning up our homes and keeping them free of toxic chemicals, the next recipe I will post will be for dishwasher detergent. So many conventional detergents, from powders to liquid to pods, contain several ingredients that can be toxic to our health: things like hormone disruptors, carcinogens (cancer forming), and respiratory irritants. As we put these in our dishwasher, not only to we breathe in the scent from them as the particles whiff through the air, but traces of them can be found on our dishes: the place where we put our food and the food for our children. So, finding a non-toxic alternative is important to our overall health and well-being. And remember, as discussed earlier, it is never just “one thing”. Cleaning up our home involves looking at every chemical product that we bring in to it, because all together, from our toilet bowl cleaner to our laundry detergent to what we use in our kitchen, they all add up together to create a chemical storm within our homes. The original recipe is by Katie at Wellness Mama. Combine all ingredients and store in an airtight container. Add 1 Tbs. per dishwasher load. I combined all of the ingredients in a quart Mason jar with a tight lid and then shook to mix it thoroughly. You may use white vinegar as a rinse agent, but it is not necessary. Were could I find washing soda? Take a 9×13 baking pan. Spread a thin layer of baking soda in the pan. Heat oven to 400 degrees Fahrenheit and bake baking soda for an hour. Stir to mix, and then bake for another hour or so (until the color is dull and yellowish). If you use a glass pan, it takes about 2 hours. A stone or metal pan takes less time. This website is dedicated to helping the reader towards better health by taking a holistic, natural approach with a special emphasis on the digestive system. For some of you, changes may come quickly, and for others, reaching your health goals may take some time, even years. The most important thing to remember is that no matter how long it takes, it starts with your first step. Do not be afraid to take that first step towards health, and keep moving forward! This week has just been one of *those* weeks. Anyone else with me there? . The thing is, life is hard. Some days are a struggle just to get out of bed and get through the day. But here's the thing: once today is done, you will never have to do it again. Ever. Tomorrow is always fresh with no mistakes in it. Our struggles are real, but as long as we keep putting one foot in front of the other, we will succeed. . Hang in there ❤️ . . . I have a question for you: what is on your skin right now as you read this? Stop for a second and really think about it. I'll play along too 😉 So I have some eye shadow on, lip gloss, mascara, a touch of powder to cover up the dark circles under my eyes ... I'm wearing deodorant, used some lotion on my skin earlier, and applied a few essential oils. . So I Googled to see how many different ingredients I would have on my skin right now if I used regular brands of each of these products (except the oils), and I came to an average of 155 different ingredients, not including colors or dyes. That also doesn't include the soap, shampoo, conditioner, or toothpaste I used earlier today. You may wonder: what's the big deal? . The big deal is, of the 13,000 chemicals used in cosmetics, only 10% have been tested for safety. Manufacturers run their own safety tests but don't have to report their findings to the FDA before releasing new products. That means that I could create my own makeup right now in my basement using goodness knows what, and tomorrow I could market it as the new Clinique. . One report found that 96% of makeup items tested contained lead. Many contain parabens (linked to breast cancer) and talc (linked to ovarian cancer). They contain preservatives like BHA and BHT which are known endocrine disruptors (think thyroid and hormones). . Formaldehyde has been banned as a known carcinogen (cancer causing), but several chemicals in cosmetics that act as preservatives slowly release formaldehyde as they age. Our skin absorbs what we put on it, and it's SO IMPORTANT to know what you're putting on your skin! There are so many better options available now ... I beg you, don't wait until it's too late before you start cleaning up your beauty products please please please!!!! Medical Disclaimer: The Content on this website is not intended to be a substitute for professional medical advice, diagnosis, or treatment. Always seek the advice of your physician or other qualified health provider with any questions you may have regarding a medical condition. “The GAPS Diet” is trademark of Dr. Natasha Campbell-McBride. More information about this nutritional program can be found in her book “Gut and Psychology Syndrome” or the official website www.gaps.me. All information, photos, and other content on this website is the property of Healthy Home Body LLC. It should not be copied or altered without the express permission of Alicia Dragic, RN, CGP.